It is very popular nowadays is to pop anti-inflammatory drugs like lollies for just about any kind of sprain, strain or bruise. Despite their popularity, there is usually no need at all to take these drugs Few people are aware of the downsides that may negate any supposed benefits. 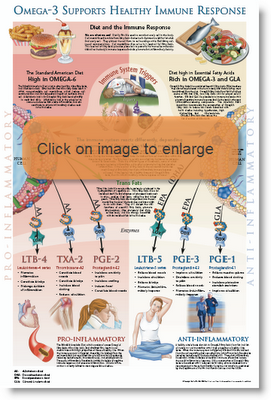 Inflammation signals that the body is responding, as it should, to an injury or infection. Inflammation is necessary to stem the damage, stabilise and repair When allowed to run its natural course, the usual end result is a timely return to full health and fitness. Anti-inflammatory drugs interfere with this natural healing processes, giving the user a false recovery that is premature. In the case of injury, there are few cases where I feel these drugs are beneficial. Please refer to the chart to the left. What this chart tells us is we have little need for anti inflammation medications if we have a diet that is supportive of a healthy immune response. Inflammation is the body's natural response to stress from infection or injury. To think we can do better by the way of a crude drug is arrogance. Caused by histamines from mast cells, kinins from precursors in the blood, prostoglandins from damages cells andleukotrienes from basophils and mast cells. Blood flow increases, extra clotting factors, antibodies localize. Occurs within one hour, neutrophils and then monocytes arrive and leave the blood stream(emigration) as a result of chemotaxis. Neutrophils and macrophages (short life span) die and form pus (in the case of infection). This begins the tissue repair process. Pus eventually drains. " You will feel this process as localised heat and swelling. This is caused by the increased blood flow and immigration of fluid and cells into the damaged area. This is a good sign that your body is doing what it is supposed to in such circumstances. Tissue repair, in the case of a sprain or tear, involves the laying down of strong cross-linked collagen fibres that bind the damaged tissue creating a repair job that may actually be stronger than the original structure. This process is usually complete within a week or so for most sprains and strains. The problem with anti-inflammatory drugs is this natural and essential process of repair is interrupted by the drug action. While you may be able to get back into action quicker, this may be at the risk of being left with a weak and incomplete repair job. This may set you up for a chronic niggling injury or even a catastrophic failure later on, such as a complete rupture! If there is an excessive inflammatory response, it is mostly because of the modern Western diet being excessive in processed sugars and Omega6 oils, including the supposedly "healthy" margarines. These foods are pro-inflammatory when in excess. You can support a healthy inflammatory response to injury by having a diet that is low in highly processed oils and refined grains. Emphasise a diet that is high in unprocessed foods, including fish, flax and olive oils which are rich in Omega3 oil (A better balance between Omega3 and Omega6 oils encourages a healthy inflammation response). Brightly coloured fruit and vegetables are rich in plant anti-oxidants that help the inflammation response by mopping up damaging free radicals. Pain Relief - We are conditioned from birth to be fearful of pain and that any level of pain must be treated by means of a medication. In defence of pain: Pain is natural. Pain tells us when and how much a damaged part may be used. Using pain relief before and during physical activity places a person at risk of further injury - if it hurts so much that pain relief is required, the message is to stop and rest up! Convenience and the course of least resistance - Your doctor usually has about 10 minutes to assess the injury, decide on a course of action, prescribe and explain what to do. Usually the most convenient is to prescribe a Pharmac subsidised drug and refer you to a physiotherapist who is subsidised by ACC. Its a familiar and well-trodden path. Highly profitable - Anti-inflammatory drugs generate millions of dollars for their producers and sellers. Millions are spent on advertising and promotions to promote the virtues of these popular medicines. On the other hand; the case against their use is muted and without funding. The battle is extremely uneven. Healthy alternatives to managing pain and inflammation barely get a look in. While I am not entirely against the use of anti-inflammatory medications, I can not tell you the last time I took any myself, or when I last recommended them to another person. They are largely unnecessary. If you feel compelled to take one, take the least you can and for the shortest time. Good nutrition, rest, elevation, gentle exercise, heat and even gentle massage are much more effective measures over the long term. Have confidence that Mother Nature will do a much better job.